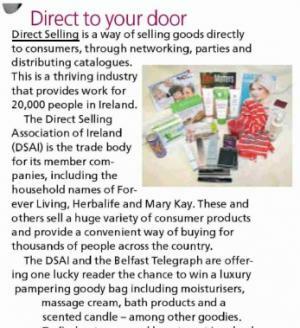 The Southside People have featured the DSAI and the direct selling industry! 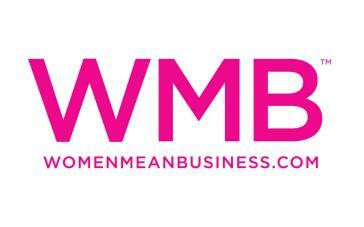 Their very thorough article covers everything from what to expect with direct selling for example flexible working. It also mentions that there are 20,000 direct sellers in Ireland. 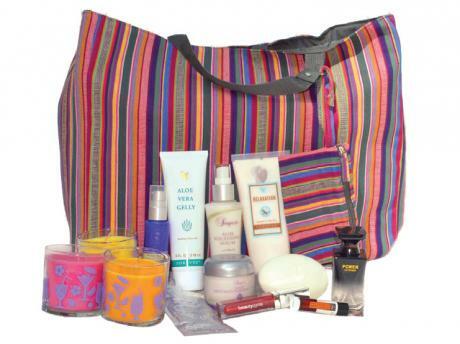 Win a Goody Bag worth £200! 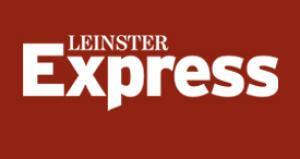 Readers of the Belfast Telegraph have the chance to win a super giveaway from the DSA! One lucky reader will win a luxury goody bag filled with treats from DSA Members, totalling at £200! Grab your copy to enter today. Belfast Telegraph are offering one lucky reader the chance to win a goody bag filled with pampering treats from DSAI Member Companies. Good luck! Interested in becoming a direct seller? 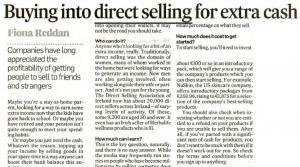 The Irish Times have featured the DSAI and the direct selling industry! Their very thorough article covers everything from what to look for when joining a direct selling company to facts and figures about the direct selling industry. 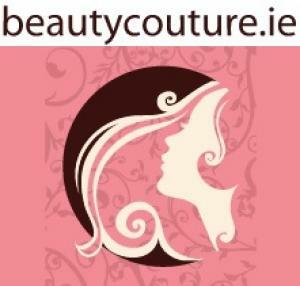 beautycouture.ie are offering a lucky visitor the chance to win a beauty hamper worth €250 filled with a wide variety of pampering products from DSAI Members! Woman's Way are giving one lucky reader a chance to win a goody bag filled with pampering goodies from DSAI Members, worth €200! Pick up a copy and enter today. The Irish Examiner has shared the latest survey results from DSAI, which reveal a 70% growth in the number of direct sellers over the age of 50 years old. 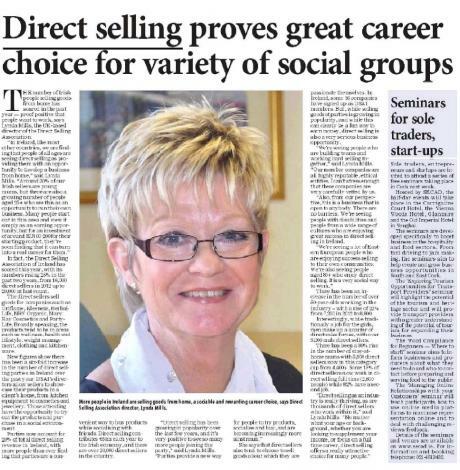 DSAI Director General, Lynda Mills, also shares why direct selling is suh a fantastic opportunity for so many people. 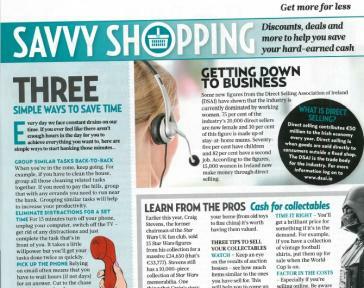 Latest industry figures from the DSAI have been featured in Woman's Way magazine, sharing the growth of working women within the direct selling industry and discussing what direct selling is. 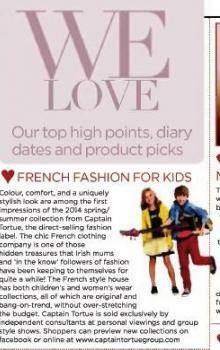 You can find the piece in the Savvy Shopping section of the magazine. 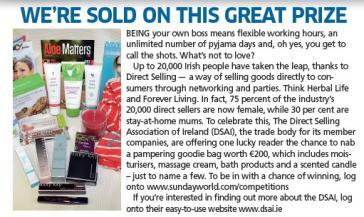 DSAI featured in Sunday World Magazine! 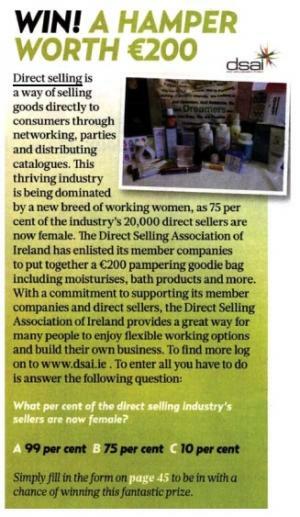 The Direct Selling Association has been featured in Sunday World's Magazine+, citing our latest survey results and giving lucky readers the chance to win one our wonderful Goody Bags, filled with treats from all of our fantastic DSAI Member Companies! There are now an incredible 20,000 direct sellers operating in Ireland, all of which contribute and amazing €50m a year to the Irish economy! The direct selling industry in particular has seen a fairly large rise in recent years as an alternative to traditional means of employment. New figures released by DSAI show that female entrepreneurship is at an all time high, with 75% of all direct sellers in Ireland being women, and 30% being stay at home mums. Figures also show that the direct selling industry now contributes a staggering €50m a year to the Irish economy. 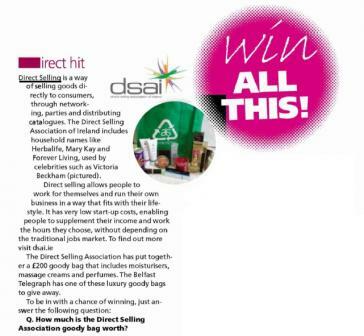 RTÉ Guide are giving one lucky winner the chance to to get their hands on a DSAI Goody Bag, filled with a great range of high quality direct selling products from our great DSAI Member Companies! Competition closes Friday 6th February and you can enter through Facebook or Twitter. Parties now account for 20% of the total direct selling revenue in Ireland, with more people choosing to shop from home, with the opportunity to buy products and socialise with friends at the same time. 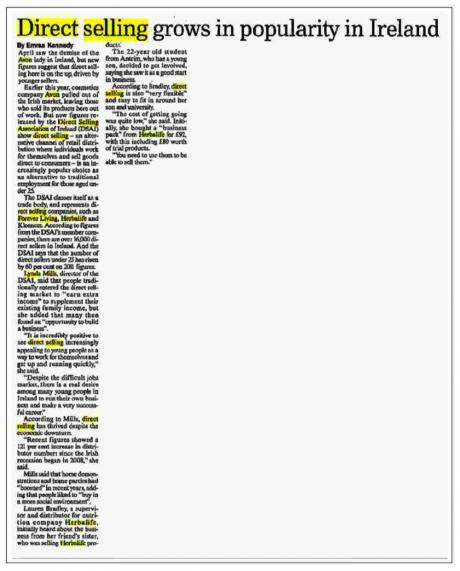 Read the full article by clicking onto the image below. Avon may have pulled out of Ireland, leaving its 5,000 members in the lurch in April 2013, but that hasn't meant the end to product parties, purchase catalogues and door knocks across the country. Peigin lives in Ovens, Co. Cork, with her husband and their two daughters. She is a stylist with international accessories brand Stella & Dot. "Direct selling is perceived as being very old-fashioned and I could never have imagined myself as being an Avon lady. 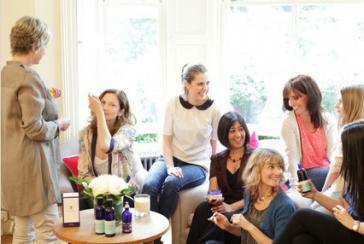 I was working for Elemis when a colleague, Lucy, left to become a stay-at-home mum in America. She'd only been there a while when I saw on Facebook that she was selling jewellery. I wanted to be supportive so I logged on to her website and instantly fell in love with Stella & Dot. The pieces are brilliant quality, beautifully packaged and on trend. All I wanted to know was when it was hitting Ireland. I had to wait a year-and-a-half for that to happen, so in the meantime I took redundancy from my job. I was able to use some of that money to buy my Stella & Dot start-up pack so everything fell into place for me. The packs cost from €200, but I invested €1,000. I gave myself a month to see a return on the investment - it's a business with immediate results if you put the work in. If you were to sell Stella & Dot as a hobby for three to four hours a week, you'd earn between €250 and €500 a month. Part-time of ten hours a week will bring in €800 to €1,000 a month. Full-time, once you build and coach a team, the sky is the limit - there are plenty of stylists in the US earning a six-figure sum. To launch a business like this, you need to use your friends and family to get you through the door. Selling to strangers is much more pleasurable because they see you as a stylist. I've actually become more fashion-conscious and stylish through this work. Before, my disposable income went on the house and the kids but now I need to look the part. I work at property styling on the side for some secondary income, but that's slowly fading away as I become busier with Stella & Dot. I do an average of two trunk parties a week. These are held in the home of a hostess, who gets some freebies and discount in return. There is absolutely no pressure for people to buy, they'll either be into the brand and want to purchase or it won't be their thing. It's a social occasion and good craic either way. Generally in a party of 12, between eight and 10 women will make a purchase. Stella & Dot hosts quarterly meet-ups where stylists can see new stock and get training on hosting shows. There are also plenty of videos and manuals available, but biggest help has been my friend Lucy who is my sponsor. The company has a very transparent structure for moving upwards but you only go to the level you want to. I now manage my own team of 18 stylists and provide one-on-one coaching to them. That's my favourite thing about the business - how social it is, both with customers and other stylists. Stella & Dot is positive, women-oriented and very supportive. It's made me very happy." Jenny is originally from North Carolina but now lives with her partner Gerard in central Dublin. A trained massage therapist, she is a consultant for Neal's Yard Remedies Organic, a range of organic beauty, skincare and aromatherapy products. "I first joined up with NYR Organics two years ago. A fellow aromatherapist first introduced me to the brand. I had no experience of direct selling before that and was mainly interested in getting a good discount on products that I could incorporate into my treatments. The joining fee is €125 and for that you get a kit of the top-selling products. The whole idea is that you try them yourself and fall in love with the brand so that you can be passionate about selling it. I'm not naturally a sales person but I think that people gravitate towards someone who has a genuine interest in a product. NYR Organics has a home party model but that wasn't for me. Those parties are still huge in the US and UK, but Irish people are not as embracing of them as they were in the 1980s. Instead, I incorporated the products into aromatherapy and skincare workshops, and also have catalogues and my own website that I sell through. Giving people samples to try is really important. You want them to know and trust the product. In the six years I have been in Ireland, there has been a definite shift towards natural and organic products. The NYR Organic range is certified by the Soil Association in the UK and all of the ingredients are natural. Skincare is the biggest seller followed by essential oils for me. The mother and baby range is also very popular because pregnant women are very careful about what they are putting on. It was a real education for me to see how much women in this country spend on beauty products. I'm in the process of opening up a holistic therapy centre with a colleague in Fairview and we need to have a beauty offering if we're to be successful, so the NYR Organic products are perfect for us. You get out of direct selling what you put into it, so your profits can fluctuate wildly. Last year I was very focused on NYR Organics and it accounted for 20-25 per cent of my profits. At the moment my focus is on setting up the centre so I haven't done much selling but I know it's there to dip back into. With NYR you get paid 25% commission for every item you sell. Some months I come out with zero because that's precisely the amount of work I put into it. Others I make €300-€400 and that's without it being my main work focus. I've been a team leader for a while and stepped back down, but you can always go up again when you have the time. It was never my goal to make a career from direct selling but as a complement to my business it has worked out really well." Dymphna is a mother-of-two from Navan, Co. Meath. Both she and her husband Gerry are managers for Betterware homewares and cleaning products. "I work full-time for Betterware and look after a team of about 20 part-time people across Dublin and Meath. They will spend a couple of hours every evening delivering catalogues - about 300 in an eight to 10-hour week - and then calling back to see if anyone would like to place an order. The majority use Betterware to top up their incomes. With all of the extra Government charges and wage deductions, people are finding it hard to get by. Those who need the money are the best people you can hire for a job like this because they have the motivation to do well. In 1988 my family moved to the UK because of the last recession. There, Gerry applied for a part-time job with Betterware to bring in some extra money. It was only when we moved back to Ireland in 1997 that I took it up. Our kids were teenagers by then so I had the time. Gerry is now the manager for all of Ireland so his job is to recruit and train managers, who in turn recruit distributors. Betterware has a really varied range, from cleaning products and homewares to mother-and-baby items and gadgets that make life easier for the elderly. Demand changes seasonally. Brooms and mops are always big sellers, but in the summer there's more call for gardening equipment and, coming into the winter, people will start buying gift items for Christmas. Plenty of people ask why they should buy from us when they can get a lot of the same products cheap in Lidl. Purchases from a discounter won't get delivered to your door by someone with a smile on their face - nor will they be guaranteed for 12 months like all of our products. I also think that in a recession catalogue shopping helps people buy only what they actually need and can afford. We get a huge amount of repeat business. After someone has placed an order, they are no longer buying from a catalogue but buying from a person. They start to get to know you and know that you are reliable and it grows from there. Direct-selling is not for everyone. If you are going to spend two hours out in the rain delivering catalogues every day then you need to love what you are doing. We all have bad days but there are some fantastic days too, which makes it worthwhile." Amy lives in Urlingford, Co. Kilkenny. She is a manager with Forever Living health and beauty aloe vera products. 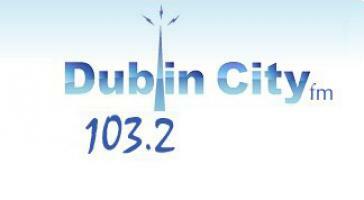 "I studied economics, politics and law in DCU and graduated in 2013. After I'd finished college in May, I was looking for jobs during the summer. I have an interest in health and wellness and I came across Forever Living products. I ordered some and started out just using them myself. As an industry, direct-selling and network marketing are areas that I didn't know existed. I had only ever heard of Avon, but Forever Living is very different. There are no parties to host or catalogues to give out, it's all about word of mouth and informing people about what's on offer. If you like talking, then this is the job for you. I have always wanted to set up my own business and this was the perfect way to do it. There are no overheads and I didn't need to get a business loan to get going, which is particularly good for someone just out of college. In the last eight months I have built up a solid business. The products are all aloe vera-based and include a range of things from weight-loss products to beauty and skincare. People tend to think that direct selling is a female-dominated area but there are a lot of guys involved. My boyfriend Padraig Phelan works with me and he looks after the sports side. Fitness is a booming sector and Forever Living does products such as protein shakes for people in training. It's a good time to be in this business because people have become very health aware. As a young person, this industry appeals on lots of levels. You don't need work experience or expertise to get started in it. I watched my parents put in long hours at work all their lives and I wanted more freedom than a traditional 9am-5pm. This gives me time to do other things and will also allow me to keep working and travel, hopefully to somewhere with sandy beaches. Self-motivation is key. I set goals for myself, such as buying a new car, and am very driven when I get going. In July we reached manager level, which is the highest-paid place on the Forever Living business plan. There's no pressure from the company to progress but if, like me, it's what you are aiming for they will support you and work alongside you. I definitely see this as my future career. There's so much potential in it and the income is uncapped." 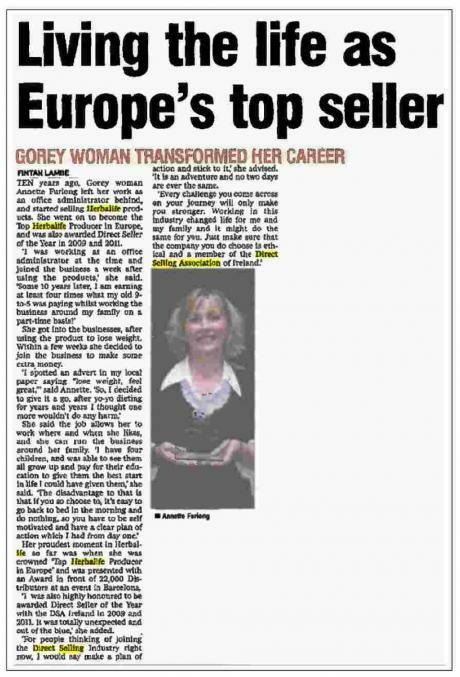 Direct Selling is booming in Ireland and the profile if people working in this manner has come a long way since the Tupperware Party and the Avon Lady. Essentially though, it remains a flexible way to earn money by selling products to a circle of personal or wider contacts for a comission or a percentage of the sale value alongside other bonuses and incentives. The numbers of people in Direct Selling have jumped 25% since 2012. 20,000 people (16,000 in 2012) now sell to consumers outside of a fixed retail environment. 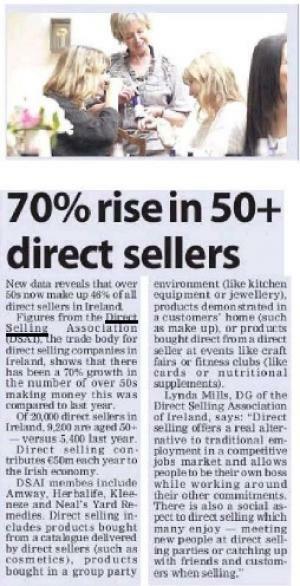 Figures from the Direct Selling association of Ireland (DSAI) show 4,000 new direct sellers and a 28% rise in revenues in the last year. There has been a 25% increase in the number of people earning money through Direct Selling here in the last year. 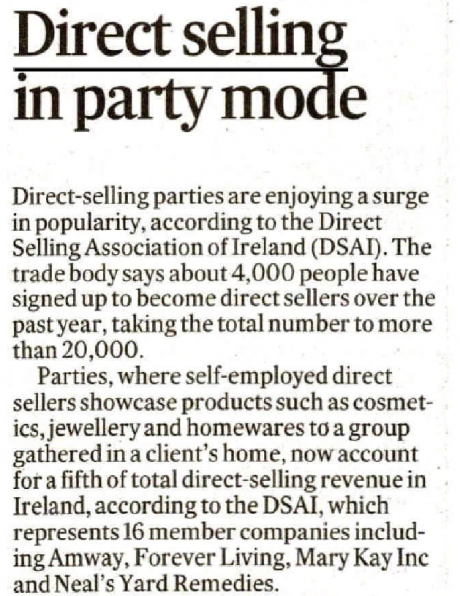 The Direct Selling Association of Ireland said there are as many as 20,000 people working as Direct Sellers. Up from 16,000 in 2012. Direct Selling is where good are sold outside of a fixed retail environment. It allows people to effectively run their own micro-business, selling well-known product lines with the support of a chosen Direct Selling firm. The industry is continuing to rise in popularity here with 4,000 new Direct Sellers and a 28% rise in revenues generated over 2014. The DSAI is the trade body that represents Direct Selling companies including Amway, Forever Living, Herbalife, Morinda, Neal's Yard Remedies and Oriflame. Lynda Mills, director of the DSAI said : "Direct Selling as an industry is really thriving as are thousands of Direct Sellers who work within it." She added: "Direct Selling offers a really attractive choice for many." 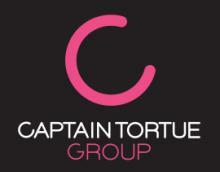 The Irish Daily Mail have featured one of our member companies, Captain Tortue, in their product picks. The newspaper promoted the 2014 Spring/Summer Collection for both Miss Captain and Little Captain Collections. We know you love beauty goodies ladies and so we’ve teamed up with the Direct Selling Association of Ireland to give you the chance to nab a goodie bag worth a whopping €200! Direct Selling is a way of selling goods directly to consumers, through networking, parties and distributing catalogues. This thriving industry provides work for over 16,000 people in Ireland. The Direct Selling Association of Ireland is the trade body for its member companies, including the household names of Forever Living, Neal’s Yard Organic and Herbalife. These and others sell a huge variety of consumer products, and provide a convenient way of buying for thousands of people across the country. 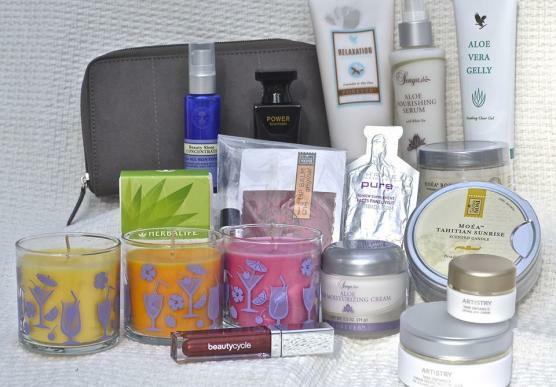 The Direct Selling Association of Ireland has enlisted its member companies to put together a €200 pampering goody bag including moisturisers, perfume, cosmetics and a scented candle – amongst other goodies. With a commitment to supporting its member companies and direct sellers, The Direct Selling Association of Ireland has become great way for many people to enjoy flexible working options and build their own business. Congratulations to Margret Mitchell of Kilcock who has won a DSAi gooody bag through the competition featured in Women's Way Magazine. 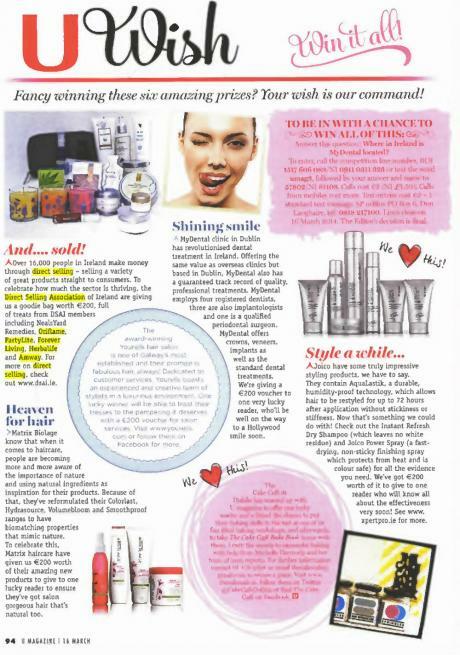 The goody bag can still be won through other competitions such as in U Magazine featured below. This fantastic prize is worth over €200. The terms and conditions of this exciting competition can be viewed on their website. Many congratulations to all our winners so far and good luck to everyone who has entered so far. 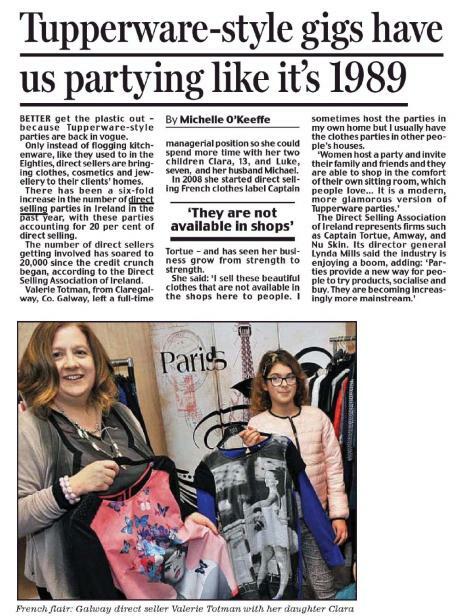 The Irish examiner featured a great article on the increase in mothers working within the Direct Selling industry here in Ireland. There are over 16,000 direct sellers in Ireland, including almost 5,000 working mothers, data from the DSAI has shown. This represents an 8% rise in the number of direct seller mums versus 2011 figures. The DSAI's member companies include Amway, Herbalife, Kleeneze, Nikken and Nuskin. DSA director Lynda Mills said: "Parents are often faced with an impossible choice — return to work, often under difficult conditions and face astronomical choldcare costs — or stay at home, resulting in no income. Direct selling, however, is offering many women the opportunity to work around their commitments — giving them the flexibility to work as and when they choose, while still looking after the children." A goodie bag of products worth over €200 has been generously donated by members of the DSAI. 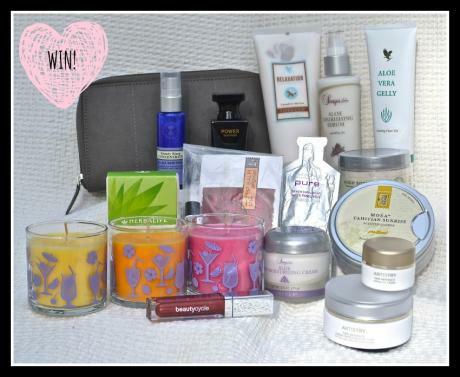 It is a competition prize offered to the readers of U Magazine in March where the lucky winner will receive products from Neal's Yard Remedies, Oriflame, Partylite, Forever Living Products, Herbalifee and Amway. Men joining the Direct Selling industry is on the increase in Ireland with figures showing an 8% rise over the last two years. Men now account for 38% of direct sellers in Ireland. 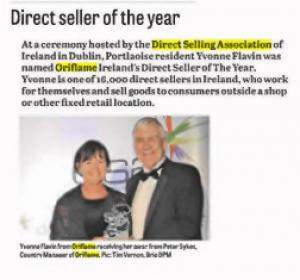 The DSAI featured in an article written by Michael Doyle in the Sun, which showed that direct selling has also shown an increase in the number of people involved in the business. Overall sales for the industry have more than doubled since the recession began in 2008 as opportunities in more traditional work have shrunk. The flexibility and earning potential of direct selling has proved to be an attraction and appeals to a wide range of demographics. DSAI Director Lynda Mills said: "The findings represent key changes to the traditional direct seller within the industry, which is conventionally dominated by working mothers." was recognised further for her achievements when the Leinster Express picked up her story from the DSAI Awards Dinner in November. Over 16,000 people in Ireland make money through direct selling. 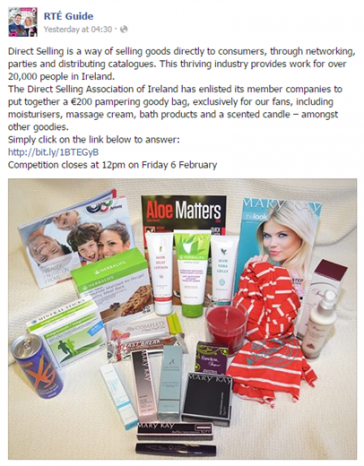 To celebrate this thriving sector U Magazine held a competition for a goody bag worth €200, full of treats from Direct Selling Association of Ireland members including Neals Yard Remedies, Oriflame, PartyLite, Forever Living Products, Amway, Herbalife, Captain Tortue and Morinda. Congratulations to Claire Howard from Castleknock, Jessica Hughes from Balbriggan and Roisin Duffy from Blanchardstown, our winners! 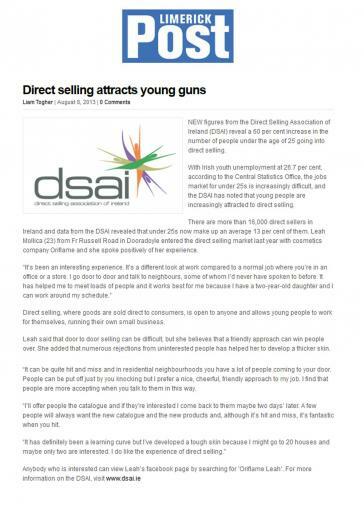 New figures from the Direct Selling Association of Ireland (DSAI) reveal a 60 per cent increase in the number of people under the age of 25 going into direct selling. With Irish youth unemployment at 26.7 per cent, according to the Central Statistics Office, the jobs market for under 25s is increasingly difficult, and the DSAI has noted that young people are increasingly attracted to direct selling. There are now more than 16,000 direct sellers in Ireland and data from the DSAI revealed that under 25s now make up an average 13 per cent of them. Leah Mollica (23) from Fr Russel Road in Dooradoyle entered the direct selling market last year with cosmetics company Oriflame and she spoke positively of her experience. "It's been an interesting experience. It's a different look at work compared to a normal job where you're in an office or store. I go door to door and talk to neighbours, some of whom I'd never have spoken to before. It has helped me to meet loads of people and it works best for me because I have a two-year-old daughted and I can work around my schedule." Direct selling, where goods are sold direct to consumers, is open to anyone and allows young people to work for themselves, runing their own small business. 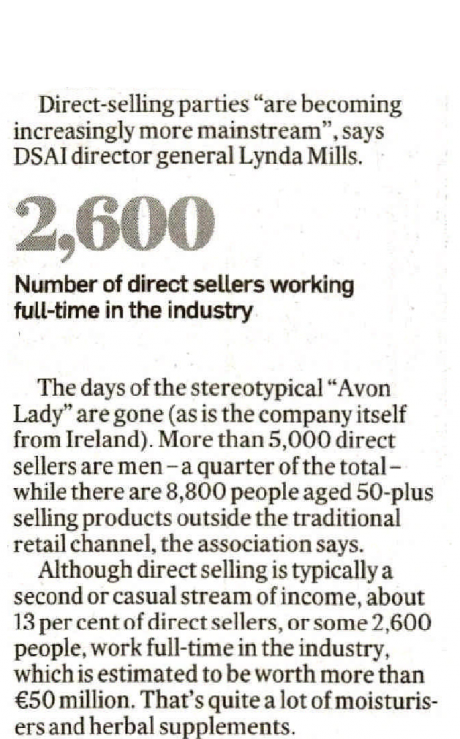 April saw the demise of the Avon lady in Ireland, but new figures suggest that direct selling here is on the up, driven by younger sellers. Earlier this year, cosmetics company Avon pulled out of the Irish market, leaving those who sold its products here out of work. But new figures released by the Direct Selling Association of Ireland (DSAI) show direct selling – an alternative channel of retail distribution where individuals work for themselves and sell goods direct to consumers – is an increasingly popular choise as an alternative to traditional employment for those aged under 25. The DSAI classes itself as a trade body, and represents direct selling companies, such as Forvever Living, Herbalife and Kleeneze. According to figures from the DSAI's member companies, there are over 16,000 direct sellers in Ireland. And the DSAI says that the number of direct sellers under 25 has risen by 60 per cent on 2011 figures. Lynda Mills, director of the DSAI, said that people traditionally entered the direct selling market to "earn extra income" to supplement their existing family income but she added that many then found an "opportunity to build a business." 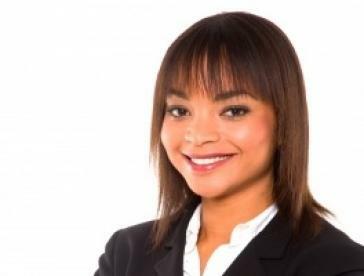 "It is incredibly positive to see direct seling increasingky appealing to young people as a way to work for themselves and get up and running quickly," she said. "Despite the difficult jobs market there is a real desire among many young people in Ireland to run their own business and make a very successful career." 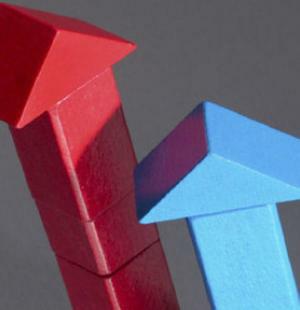 According to Mills, direct selling has thrived despite the economic downturn. "Recent figures showed a 121 per cent increase in distributor numbers since the Irish recession began in 2008," she said. Mills said that home demonstrations and home parties had "boomed" in recent years, adding that people liked to "buy in a more social environment." Lauren Bradley, a supervisor and distributor for nutrition company Herbalife, initially heard about the business from the friend's sister, who was selling Herbalife products. The 22-year old student from Antrm, who has a young son, decided to get involved, saying she saw it as a good start in business. According to Bradley, direct selling is also "very flexible" and easy to fit in around her son and university. "The cost of getting going was quite low," she said. Initially she bought a business pack" from Herbalife for £92, with this including £8 worth of trial products. "You need to use them to be able to sell them." The Direct Selling Association of Ireland (DSAI), whose members include Amway, Forever Living and Herbalife, has released new figures that show a significant rise in the number of people turning to direct selling since the start of the recession, as a way to earn additional income. 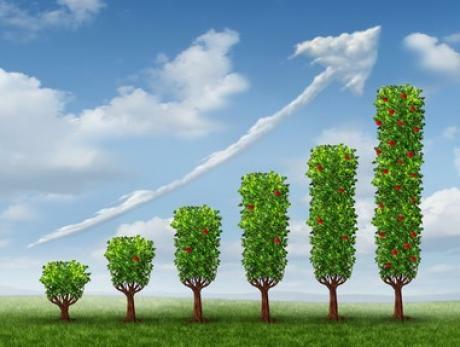 The new figures show a 121% increase in distributor numbers since the Irish recession began in 2008, whilst sales throughout the industry for the same period have more than doubled, with three of the largest direct selling companies in Ireland reporting a 103% increase in sales between 2008 and 2012. The DSAI also revealed a substantial rise in revenue being generated through ‘party’ sales, where direct selling consultants demonstrate products in a client’s home before offering them for sale to the assembled group. 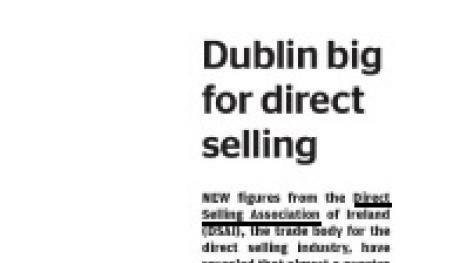 The DSAI’s largest members have reported a 195% increase in revenues generated this way between 2008 and 2012, and home selling parties now account for nearly a fifth (19%) of the industry’s €50 million revenue.